Abandon: to give up with the intent of never again claiming a right or interest in… A feeling or attitude of wild or complete freedom. I looked it up. I looked it up because I woke up with the Newsboys singing, Live With Abandon in my head, particularly these lines. Sometimes, I like to think of a thing by looking at its opposite. And the opposite of abandon, when I’m thinking of this song, would be restraint, inhibit, constraint. It makes me sad to think I have lived most of my life inhibited and restrained. Maybe reserved would be a better word. I have reserved part of my self for ME, rather than giving it all to The Lord and to those I love. I’ve only given God some of me, part of me. The part I want Him to see, which is pretty ridiculous considering He sees all and knows all. Dear Father, forgive me. Dear family, I’m so sorry and I promise to give it all I’ve got! Oh, how I want that feeling of complete freedom in Christ. To know and trust that His will for me is perfect. That the will of God won’t take me where the grace of God won’t follow. To let go of all this reservation, restraint, inhibitions, constraining legalism and just let God guide my heart and my life. Abandon… I’m giving it up with the ‘intent to never again claim a right or have interest in’ the old life. Today is Flag Day. 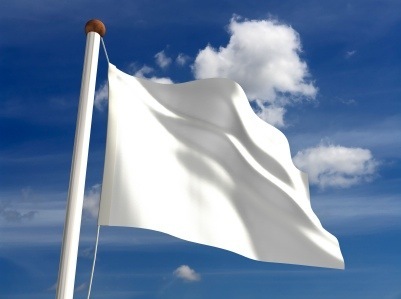 I’m waving the white flag this morning and surrendering to the JOY! !